“FRESHFARM needs your help! We have an important update to share about the FRESHFARM Dupont Circle Farmers Market. The District Department of Transportation (DDOT) is exploring the creation of a north-south protected bike lane to connect the Dupont Circle neighborhood with Foggy Bottom and the National Mall. This week, the Dupont Advisory Neighborhood Commission (ANC 2B) made a motion to recommend that the protected bike lane be constructed along 20th Street NW, which would travel directly through the market. While FRESHFARM strongly supports more protected bike lanes throughout the city, we are very concerned about the impacts the proposed bike lane will have on market operations. A protected bike lane along 20th Street could reduce the footprint of the Dupont Circle Farmers Market by as much as 60% and create serious safety hazards for shoppers, farmers and producers, as well as cyclists. 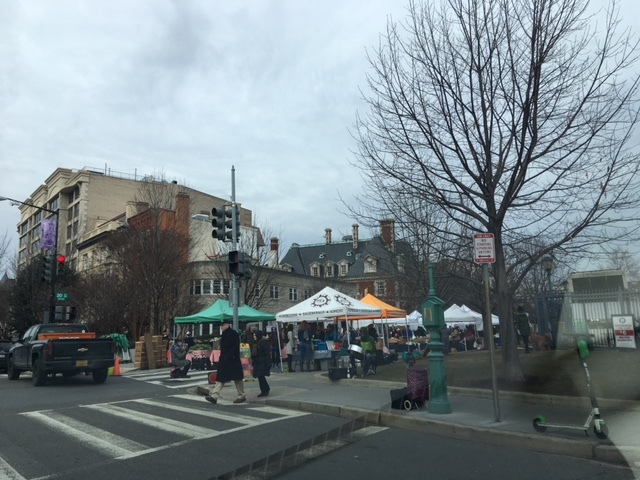 When considering the 20th Street Bike Lane project, I encourage DDOT to strongly consider uninterrupted operation of the FRESHFARM Dupont Circle Farmers Market in the design of a safe and connected bike lane for our community. Comments can be submitted to [email protected] or through this website. The comment period closes on Wednesday, February 13. If you live in ANC 2B, we encourage you to also reach out to your ANC commissioner, and if you live in Ward 2, we encourage you to contact Councilmember Jack Evans to express your support for the farmers market. The DDOT proposal is currently at the 10% design phase; we will keep our community informed of future opportunities to get engaged as the the proposal moves toward the 30% design phase.